There is no greater feeling of freedom and anticipation, than unpacking your clubs in expectation of the exhilarating 18 holes ahead. But if you have chosen to play in a pair, then picking the wrong partner can make your round seem like an eternity. Here are some of the characters to avoid accompanying on the course. Offering to take your rookie friend or workmate on the fairway for the first time sounds all very sociable but think about it: do you really want to spend half an hour on the first tee, growing steadily more crimson with embarrassment and rage as they hit airshot after airshot before dangerous slicing one ninety degrees in the direction of the club shop, while all those members you took months ingratiating yourself with mutter with impatience in the queue to tee off. Next time you feel like ruining your chances of a decent round, why not simply forget your clubs! To the old Hollywood adage of never work with children or animals should be added . . . and never, ever play golf with your boss. Think about: play too well; indeed, even go as far as to better his score card and that pay rise and new company car you go to bed dreaming of will be permanently stuck in the rough; on the other hand, play too badly and he'll think: a) you're only doing it to save that aforementioned promotion; or b) you're just not cut out for the challenge of middle management. Face it, we've all seen them, or at least heard them on the wind. Every club has at least one member who takes every shot like it's the 18th green on the final round of the Open Championship. While all around them are quietly going about their business of keeping the ball out of the rough, the Winner is mentally thinking outside the box, stretching the proverbial envelope, and shouting 'way to go' every time the ball sails off into the distance. And pity the poor soul stuck with this guy. If they even dare to outscore him or her on one hole, there is not so much a gnashing of teeth as the unpalatable sight of a club being swung around in frustration or thrown to the floor in a tantrum. 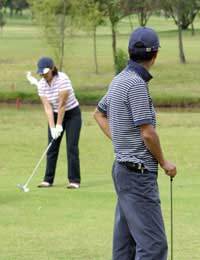 A bad workman blames his tool; a pompous golfer invariably acts like one. What better than a pleasant round with your nearest and dearest's mum, dad, brother or sister? Actually, anything if the conversation turns to family matters. That chance to have a quiet word in your shell-like is too much to resist, especially if the subject is a sensitive one and stands a fair chance of putting you off your game. By the time the game is over, chances are you'll be heading for the car park rather than a relaxing drink in the clubhouse. So don't say you haven't been warned. Compared to some of the characters above, digging yourself out of a bunker will feel like a breeze. When you're merrily making your way round the course single handed, spare a thought for those less fortunate who never thought an innocent invitation to play a round would backfire so spectacularly.